The Olympus E-P1 is a new kind of digital camera that promises to offer DSLR image quality in an ultra-compact format. The first Micro Four Thirds model from Olympus, the EP1 has a retro design based on the Olympus Pen series of compact film cameras from 1959. The Olympus EP1 features a 12.3 megapixel Micro Four Thirds sensor in a mirror-less, metal body complete with interchangeable lenses and built-in image stabilisation. 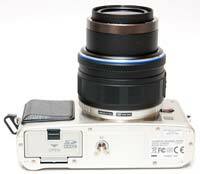 It's compatible with all Micro Four Thirds lenses and, via adapters, existing Four Thirds and OM lenses. The new TruePic V image processor at the heart of the E-P1 provides fast operation, ISO speeds up to 6400, RAW format support, and the same Art Filters found on the Olympus E-30 and E-620 DSLRs. The EP1 can also record HD 720p quality video with continuous auto-focus and control over depth of field. A 3 inch LCD screen, 3fps continuous shooting, Supersonic Wave Filter dust reduction system, a level gauge to ensure straight horizons, and auto gradation adjustment to prevent blown highlights and blocked-in shadows complete the E-P1's headline specs. 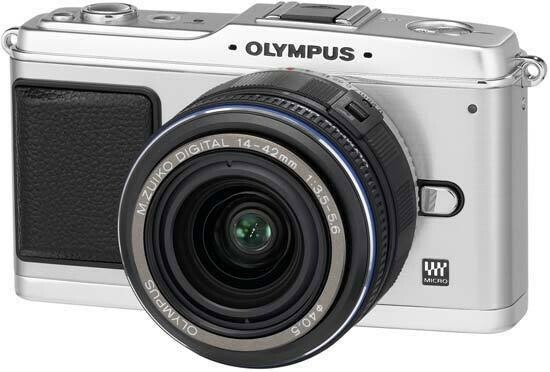 Available in silver and white, the Olympus E-P1 is priced at £699.99 / $799 with the new 14-42mm lens, and is also available in a range of other kits. The Olympus E-P1 joins the Panasonic G1 and GH-1 as the third member of the Micro Four Thirds family, but unlike the Panasonic models which resemble DSLRs, the E-P1 has a completely different design that more closely resembles a compact camera. The E-P1 takes advantage of the mirror-less nature of the Micro Four Thirds standard with a slim, all-metal body that measures 35mm deep and weighs 335g. Obviously the depth and weight increase when the supplied 14-42mm kit lens is fitted, making the E-P1 instantly more DSLR-like, but the new 17mm pancake lens maintains a compact overall package that will particularly suit street photographers looking for an indiscrete camera. The E-P1 is wider (120.5mm) than official product photos would suggest though, and it's also worth bearing in mind that it's not actually that much smaller or lighter than the E-450 Four Thirds DSLR. Photographers looking for a pocketable, take-everywhere camera will be mildly disappointed with the E-P1's size, as it still requires a small camera bag even with the pancake lens fitted. Compared to the Sigma DP1 / DP2, the only other compacts to feature a DSLR sized sensor, the Olympus E-P1 is quite a lot bigger and heavier, even without a lens fitted, and only one of those cameras will fit in a trouser pocket (clue: it's not the EP-1...). The retro styling of the E-P1 will mostly appeal to photographers old enough to remember the original Pen series of cameras, but it's not so radical to put off younger enthusiasts. Our brushed silver metal review sample actually looked very stylish in an understated kind of way, set off by a generous, textured black plastic hand-grip on the left-front of the camera, and a black panel on the rear where most of the controls are located. The E-P1 is better constructed than you'd expect given its relatively small size, light weight and mid-range price-tag. Thanks to the largely metal body, the camera feels very solid, more so than most entry- and mid-level DSLRs. Large metal neck strap eyelets are located on top of the camera at the sides, with the rear dominated by the large fixed 3 inch LCD screen. 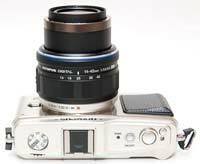 When it comes to storing your photographs the E-P1 uses SD / SDHC cards, an important decision by Olympus as this format is much more popular than the xD-Picture cards that most Olympus compacts use. The BLS-1 battery which provides up to 500 shots under the CIPA testing standard is housed next to the SD slot, both protected by a plastic lockable cover. Also found on the bottom of the camera is a metal tripod mount located almost in the centre. The best method of using the E-P1 is to hold the camera's weight in the left hand, clutching the lens, and use your right hand for balance and operating the controls. Eagle-eyed readers may have noticed that I haven't yet mentioned an optical viewfinder or built-in flash - that's because neither are actually included as standard on the E-P1. Instead, you can choose to buy the optional detachable VF-1 viewfinder and FL-14 flash, both of which slot into the E-P1's hotshoe on top of the camera. Olympus didn't send either for this review, so we can't comment on the quality of these accessories, but not having a built-in optical viewfinder and especially a flash will certainly put some photographers off the E-P1. While incorporating one or both into the E-P1 would have increased its overall size and weight, their omission ultimately makes the camera more difficult to use and less versatile, and adding one of the accessories (you can't use both at the same time) adds to the overall bulk anyway. In particular offering a range of flash synchronisation modes without any way of utilising them without purchasing an external flash feels rather strange on a compact camera. The E-P1's 3-inch, 230,000-dot rear LCD screen has a very wide viewing angle and remains visible outdoors in the sunshine too, but only if you increase its brightness level to the maximum setting. The resolution is on the low side for such a large screen, resulting in a slightly grainy display, but it does offer 100% scene coverage. The colour temperature of the screen can be modified if you think it doesn't match that of your calibrated computer monitor, but the contrast and gamma cannot be altered. The LCD screen doubles as a status display, with seven different screens on offer, which can be called up by repeatedly pressing the Info button in record mode. These include the camera's key settings and a small live histogram (although sadly not both at the same time), an innovative level gauge which makes it easy to straighten either the horizontal or vertical horizon, and a live preview of different exposure compensation and white balance settings in a multi-frame window. You can also change all the important settings right on the LCD screen, which Olympus calls the Super Control Panel. This ingenious solution spares you the pain of having to enter the menu, and makes most settings changes fairly simple. Four of the most often-used functions - ISO sensitivity, focusing mode, white balance and drive mode - each have their own dedicated button mapped onto the four-way pad. In addition exposure compensation has its own dedicated button situated on the top plate next to the shutter release button. Manual focusing is greatly enhanced by the 'enlarged display' function. Once you have selected manual focus mode, press the Info button repeatedly until a green rectangle appears in the middle of the display. You can move this rectangle to one of the 225 available points using the four-way pad, and magnify into it by pressing OK. The default magnification is 7x, but you can raise this to 10x by turning the control thumb-wheel. This is real, non-interpolated magnification, very useful for accurate manual focusing – provided you find a way to steady the camera. A second press of the OK button will let you see the full frame again. The Olympus E-P1 is equipped with two command dials for setting key options like aperture and shutter speed, but they're not the same as the forefinger and thumb wheels that you find on a lot of DSLR cameras. Instead the E-P1 uses a combination of a large silver vertical thumbwheel and a thin circular wheel that surrounds the navigation pad. In the Manual shooting mode, by default the former sets the aperture and the latter sets the shutter speed. Having both command wheels on the rear simplifies the design of the front of the camera, but obviously only one of them can be operated at once, slowing down the operation in Manual mode. In addition, the circular wheel in particular is just too small and thin for anyone with normal or large sized hands to operate easily. So while this system is better than having just one shared command dial on on many entry-level DSLRs, it isn't as intuitive as forefinger and thumb wheel system. The main menu system on the E-P1 is fairly straight-forward to use and is accessed by pressing the Menu button on the rear of the camera. There are five main menus, Camera1, Camera2, Playback, Custom and Setup. Annoyingly the Custom menu, which allows you to fine-tune the camera to suit your way of working, is hidden by default (there's an option to turn it on in the Settings menu). As mentioned previously, the Super Control Panel on the LCD screen speeds up access to some of the more commonly used options. Due to the large LCD screen and restricting the number of on-screen choices to six, the various options and icons are clear and legible. If you have never used a digital camera before, or you're upgrading from a more basic model, reading the easy-to-follow manual before you start is a good idea. Thankfully Olympus have chosen to supply it in printed format, rather than as a PDF on a CD, so you can also carry it with you for easy reference. The E-P1 has an 11-point contrast detection auto-focus system, which is automatically increased to 25 points when Face Detection is turned on. With a non high-speed contrast AF lens mounted, the camera defaults to Manual Focus mode even if Auto Focus is selected. The AEL / AFL button on the rear of the camera allows you to lock either the exposure, focus or both (customisable via the main menu), then recompose and take the image. The E-P1 offers a comprehensive set of exposure modes, including P, A, S and M for advanced users. iAuto mode automatically recognises common scenes and and adjusts the camera settings accordingly to achieve the best results, perfect for complete novices, plus there's a legion of different scene modes (19 in total). The new ePortrait scene mode allows you to soften shadows and smooth out unwanted facial features, either before taking the picture or afterwards. Olympus are also heavily promoting the E-P1's artistic capabilities, with two features in particular, Art Filters and Multiple Exposure, differentiating it from its main competitors. The 6 different Art Filters are Pop Art, Soft Focus, Pale & Light Colour, Light Tone, Grainy Film and Pin Hole - you can see the results on the Image Quality page. Unlike most other cameras, these effects are applied before taking a shot, rather than afterwards, so you can preview the effect on the LCD screen before pressing the shutter button. The Art Filters can also be applied to previously taken RAW images, either in-camera or with the supplied Olympus software. The Multiple Exposure function allows up to three images to be superimposed onto each other, creating a composite, and you can either overlay a previous shot or the image that you are about to take. Multiple Exposure even works with RAW files as well as JPEGs, whilst the Art Filters are applied to a JPEG (with an unprocessed RAW file also saved). The Art Filters are a little over-the-top for my taste, and you can't tweak the default look, but the ability to to change the exposure, white balance and other key settings whilst previewing the effect is very welcome. While the Art Filters get their own setting on the Mode Dial, the Multiple Exposure option is inexplicably buried away in the main menu system. The E-P1 offers also four different aspect ratios that enable individualised framing of scenes, including the default 4:3 ratio employed by the Micro Four Thirds system. The available aspect ratios are: 4:3, 3:2, 16:9 and 6:6. They're quite a good way of personalizing your shots in-camera, with the ability to preview the effect again proving particularly useful. 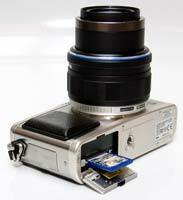 The Olympus E-P1 has a built-in mechanical image stabilisation system which can be turned on and off via the main menu. Four different options are available - Off, On (I.S. 1), turn off the horizontal image stabilizer but leave on the vertical one (I.S. 2) or turn off the vertical image stabilizer but leave on the horizontal one (I.S. 2), both for when you want to pan with your subject and keep it sharp while the background blurs. The IS system offers up to 4 EV steps of stabilisation - in practice I found that 3 EV steps was more readily achievable. Also available is the impressively named Supersonic Wave Filter, whereby any dust particles that drift inside while changing lenses settle on a filter that protects the image sensor, and are then shaken clear when the camera powers down. The Olympus E-P1 offers a number of features inherited from Olympus' recent DSLR cameras. Among these are Pixel Mapping, user-configurable mirror lock-up (called Anti-Shock by Olympus) and spot metering, which comes in no less than three variations: midtone-based, shadow-based and highlight-based. The latter two make life easier for those who know what spot metering is but do not know how to use it in combination with exposure compensation. These options come on top of the usual centre-weighted and evaluative modes. The AEL button can be separately configured, so even if you have, for example, centre-weighted set as your working mode, the AEL button can be designated to use highlight-based spot metering. The E-P1 can record high-resolution HD 720p 1280x720 movies in the 16:9 aspect ratio and standard VGA 640x480 movies in the 4:3 aspect ratio, both using the AVI Motion JPEG format at 30 frames per second. The Movie mode is accessed via selecting the Movie option on the shooting mode dial and then pressing the shutter button to begin recording, which isn't as quick or convenient as the one-touch Motion Picture button on the Panasonic GH-1. The total length of an individual movie clip is restricted to 7 minutes for 1280x720 movies and 14 minutes for 640x480 movies, apparently due to an inherent limit of 2Gb for AVI files. Stereo sound is recorded during video capture via the small internal mic on the rear of of the camera, which is a big improvement on the rather muffled noises recorded by most digital cameras. The HDMI port allows you to connect the E-P1 to a high-def TV set, but only if you purchase the optional HDMI mini-cable. The E-P1's Movie shooting mode allows you to set the aperture manually during recording, useful for changing the depth of field when there are several subjects at different distances. Note that you can't set the shutter speed, as on the Panasonic GH-1. In practice this system works well, allowing some really creative effects, but the operating sound of the control dial and in particular the auto-focus mechanism is very audible in the movie, so you'll need to edit the soundtrack later to remove them. Also, the current aperture isn't actually displayed on the LCD screen during recording, making it difficult to control the effect. More successful is the ability to use any of the 6 Art Filters during video recording as well as still images. This instantly lends an interesting art-house effect to your home movies, with the Grainy Film option being particularly appealing. The frame rate is rather drastically reduced though for two of the filters (Soft Focus and Pin Hole). A Program option for point and shoot operation completes the movie shooting modes. An Electronic Image Stabilization system compensates for camera shake, and you can take a still shot during video recording, although this also ends the movie rather than just interrupting it. You can use the zoom lens during recording and really make the most of the wide range of compatible lenses. Focusing is set as for still images via the AF navigation pad option. On the negative side, you'll find that if you choose continuous auto-focus, areas of the video will be blurred before becoming sharp again as the camera tries to refocus, and as noted above, the noise of the AF system is very intrusive. Using manual focus is much trickier but will ultimately produce better looking and sounding movies. On a more positive note, having the AF system is much better than not being able to auto-focus at all, as with all current DSLR cameras that offer video recording. Hand-holding the E-P1 during movie recording inevitably leads to obvious shake, despite the electronic image stabilizer, so for best results you'll need a dedicated video tripod. The start-up time from turning the E-P1 on to being ready to take a photo is pretty impressive at around 2 seconds. Unfortunately the Contrast Auto-Focusing system isn't going to win any speed awards, taking approximately 0.5 second to lock onto the subject and emit a loud beep (which can be turned off). Half a second doesn't sound like much, but it's enough to miss the moment and is noticeably slower than both regular DSLR cameras and the Panasonic G1 / GH1. Thankfully it usually achieves focus most of the time, helped by the AF assist lamp - the E-P1 doesn't have any notable problems locking onto the subject in low-light situations. It takes about 2 seconds to store a JPEG image, allowing you to keep shooting as they are being recorded onto the memory card - there is a brief LCD blackout between each image. Storing a single RAW image takes around 4 seconds, but thankfully it doesn't lock up the camera in any way - you can use the menu system or shoot another image while the first file is being written to memory. The Olympus E-P1 has quite a good Burst mode which enables you to take 3 frames per second for an unlimited number of JPEG images at the highest image quality, or 10 RAW images. Overall the E-P1 is below par in terms of operational speed compared to a DSLR, especially hampered by its auto-focusing speed, but faster than most compacts. Once you have captured a photo, the Olympus E-P1 has a good range of options when it comes to playing, reviewing and managing your images. You can instantly scroll through the images that you have taken, view thumbnails (up to 100 onscreen at the same time and in a Calendar view), zoom in and out up to 14x magnification, view slideshows, delete and protect an image, add a sound clip and set the print order. The Edit option offers a number of different ways to alter the look of an already-captured photo, including merging 2 or 3 into one, shadow adjustment, redeye fix, cropping, changing the aspect ratio, converting to black and white or sepia, resizing and applying the e-Portrait filter. The Info button toggles detailed settings information about each picture on and off, such as the ISO rating and aperture / shutter speed, and there are small brightness and RGB histogram and larger brightness histogram available, plus a view showing flashing under- and over- exposed areas. In summary the Olympus E-P1 is a refreshingly different, easy to use, fairly compact camera with the obvious advantages of interchangeable lenses and a DSLR sensor. 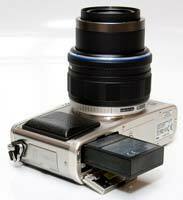 The main negatives are the lack of a built-in flash and optical viewfinder, plus the slow auto-focus system.